Is there revach at the end of shema before it? 500 years ago most Ashkenazi tefillin were like this. יעשה כל פרשיותיה פתוחות חוץ מפרשה אחרונה הכתובה בתורה שהיא והיה אם שמוע שיעשנה סתומה ואם שינה פסול. 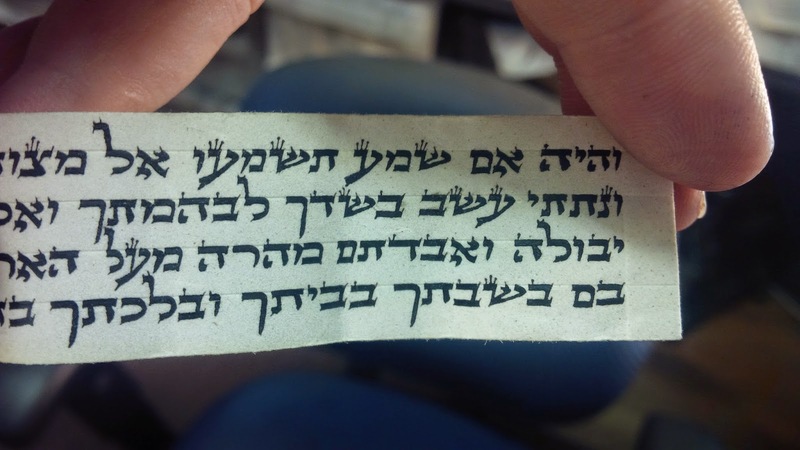 ויש מכשירים בכולם פתוחות (מהר"ם פאדו"ה סימן פ"ז בשם אורחות חיים ובית יוסף בשם העיטור). ובמדינות אלו נוהגים אף פרשת והיה אם שמוע בראש השיטה כשאר הפרשיות. MB does say that this is only b'dieved, however. Reb Eli what's the status of the parshiyot and what's to be done with them? This is amazing. Not is the Ram"a completely comfortable with this, but whats more is that it is a Shel Rosh Parshah i.e. not attached to the preceding Parshah. As a result there is not such thing as a real "stumah" anyway!!! See Magen Avraham 32:49, Mishnah Berurah 32:36 S"K 155, Shu"A Harav 32:54. Furthermore, it is on precisely something like this that the Poskim insist on its acceptability after that fact "shelo le'hotzi laaz al Ha'rishonim"!!! I feel like this is a classic, yet unfortunate, case in which the fact that we are not as poor as they once were facilitates us being "machmir" on a whim. In truth, all there is are Halachik guidelines. According to the Halachah these are perfectly acceptable. Eli, I would be very grateful if you could find out what was the Rational of the Posek for laying to rest this beautiful Parshah. Well they would only be kosher B'Diavad. According to many opinions(Rav S.Z. Auerbach and Rav Ovadiah Yosef come immediately to mind) it is forbidden to make a Baracha over B'diavad tefillin or mezzuzot. What would be the point of having Tefillin that you couldn't say a Bracha on?